To add a step to a People Flow from within the flow, press the ‘Add Step’ button. To edit an existing People Flow step, simply select ‘Edit’ next to the step. Both of these options bring up the same window. From this window you can edit a number of settings. This setting changes when a person is ‘due’ to be completed from the step. For instance, you may want someone to be processed immediately when added to a step, or the step might require that they are processed a set number of days after being added. There are a number of settings available – most of them are relative to the date they were added to the people flow step. This setting changes when people due within the flow will appear on the assigned administrator’s dashboard, relative to when the person is due. For instance, if ‘John Bubble’ is due to be actioned on the 15th of March, and the ‘Hide Pending’ setting is set to 4 days, John won’t appear on the dashboard until the 11th of March. This setting changes if you want an email to be sent to the administrators of the People Flow step when someone is added to the step. 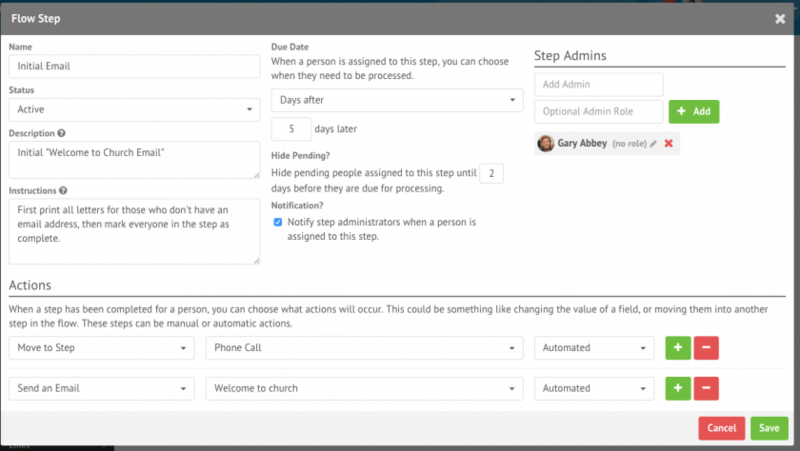 If this option is selected and a person is added to the People Flow step without being assigned to an administrator, an email will be sent out to all administrators. If they have been assigned to an administrator, only the assigned administrator will receive the email. These settings allow you to define the People Flow actions that are to be made upon completion of a step. You can chose from a range of actions, allowing you to change people’s information, people categories, groups etc. The ‘Automated’ setting for actions allows you to define whether you want the action to be applied to every person that goes through the step.